Home > Shop All Products > Sunburn Never Again! Sunburn Never Again! Relieve Sunburn Pain In Mintutes. Being outside and exposed to sun and wind these days is uncomfortable. Have you noticed that when the sun beats down on you, it starts feeling like it is burning your skin? Before you know it you are getting red and your skin is feeling dry and dehydrated. How do you get safe, effective relief from the elements damaging your skin without saturating your body with unnecessary chemicals? Instead saturate your skin with moisture. 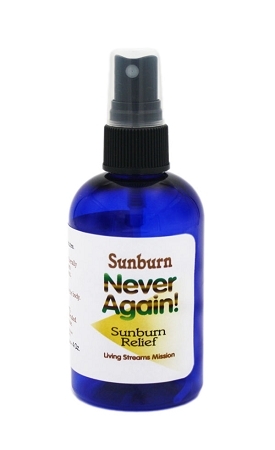 Never Again by Living Streams Mission was created to noticeably hydrate and oxygenate your skin while providing a degree of sunburn protection. The result is that your skin feels better and the sun does more tanning than burning. We have noticed that repeated applications can help eliminate peeling when you do experience sunburn. Whether you use Never Again to help with sunburn protection or after sun exposure to sooth dry, irritated skin, our product helps relieve the pain associated with the burn and speeds the healing process by providing needed nutrients to help the skin heal itself. It also helps with pain associated with other types of burns. You will be amazed! Sun and wind also dehydrates your scalp and hair. Misting it on your hair and scalp feels wonderful and you are not adding anything harmful to your body when you do it. Never Again is the perfect skin toner. Simply use it in place of other toners between cleansing your face and applying moisturizer. You may not need to use the moisturizer. If you experience eye irritation from long periods of driving or work related eye fatigue using computers, Never Again provides soothing hydration for your eyes. Also useful for hydrating dry irritated nasal passages and sinuses as well. We feel certain that you will discover many other uses for this product than listed here and as always your satisfaction is guaranteed!